The New Moon is Saturday, March 17. 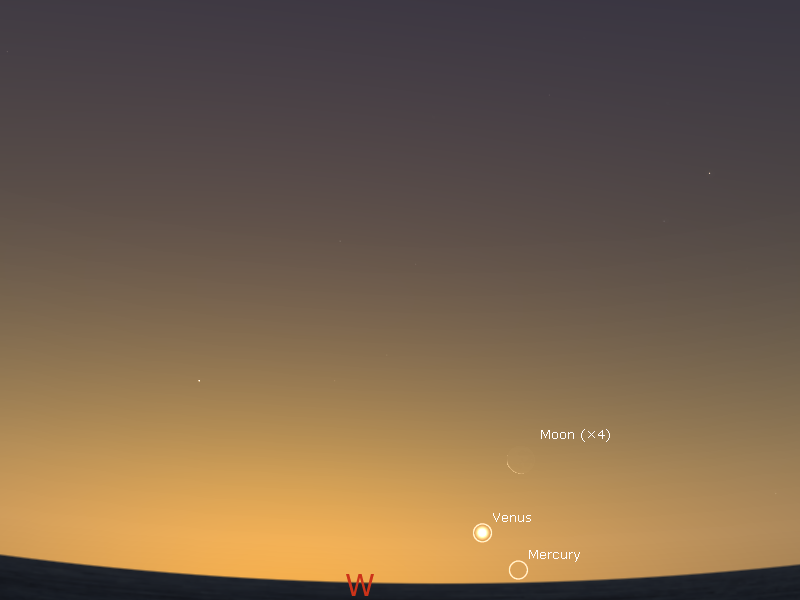 Venus and Mercury are low in the twilight. Venus is close to the crescent Moon on the 19th. 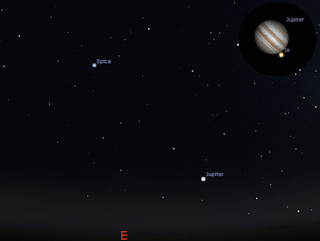 Jupiter is now rising in the late evening skies but is still best in the morning. Mars, bright Jupiter and Saturn form a line together with the bright stars Antares and Spica in the morning skies. Mars closes in on Saturn. Saturn is in binocular range of some interesting nebula and the globular cluster M22. 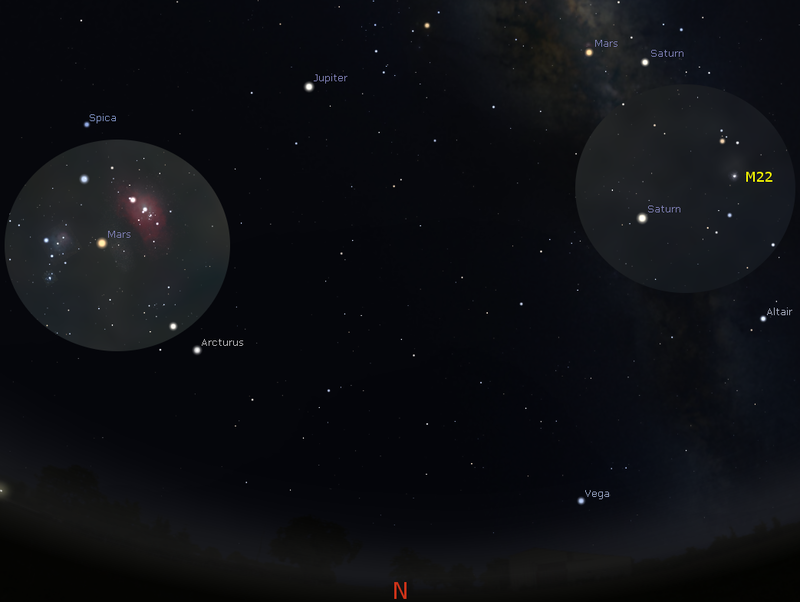 Mars is in between the Trifid and Lagoon Nebulae on the 20th. The New Moon is Saturday, March 17. Evening twilight sky on Monday March 19 looking west as seen from Adelaide at 19:54 ACDST (30 minutes after sunset). 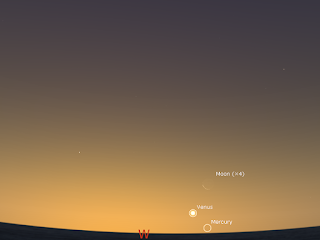 Venus and the Moon are nearby low in the twilight, with Mercury almost on the horizon. Venus and Mercury are very low in the twilight. You will need a flat unobscured horizon, like the ocean or the desert. Venus is now visible to the unaided eye (just) from 15 minutes after sunset andrelatively easy to see 30 minutes after sunset, but you will need binoculars to see Mercury low in the horizon murk. By the end of the week Mercury is lost t view. On the 19th Venus is near the thin crescent Moon with Mercury just above the horizon. Evening sky on Saturday March 17 looking East as seen from Adelaide at 23:00 ACDST Jupiter is just rising above the horizon. The inset is a simulated telescopic view of Jupiter on March 20 at 1:0 ACDST, with Io and its shadow on the face of Jupiter. Morning sky on Tuesday March 20 looking north as seen from Adelaide at 5:34 ACDST (90 minutes before sunrise). Mars is moving towards Saturn and is between the trifid and Lagoon nebulae. Saturn is coming closer to the bright globular cluster M22. Mercury is very low in the evening twilight just to the right of Venus. You will need a flat unobscured horizon, like the ocean or the desert, and binoculars, to be able to see Mercury low on the horizon. Jupiter is rising well before midnight, but it is still best to view in the morning sky, where it is high above the northern horizon. There are some good Jovian Moon events this week. Mars is in Sagittarius the archer. Mars is moving towards the Triffid and Lagoon nebulae and Saturn. From the16th Mars and the Triffid and Lagoon nebulae are visible together in binoculars. It is between the two nebulae on the 20th and visible in wide field telescope eyepieces. Scanning with binoculars around Mars and Saturn will be very rewarding now the Moon is out of the way. Saturn climbs higher in the morning sky. It is within binocular range of several attractive clusters and nebula. It is coming closer to the bright globular cluster M22 and the pair are visible in binoculars and wide field telescope eyepieces. Southern Skywatch March 2018 edition is now out!